The most recent column in Savage Love had a theme featuring letters on the subject of gender-neutrality and genderfluidity. You’ve probably come across the term “genderqueer” conceptually even if you’re not aware of people within your own life to whom the title might be applied: people who might consider themselves to be of no gender, or of multiple genders, or of variable gender, of a non-binary gender, or trans (gender’s a complex subject, yo!). 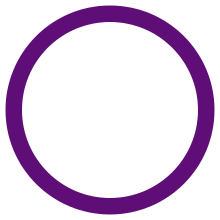 If you’ve come across the purple circle symbol before and know what it signifies then you probably know far more than this article will ever tell you. For about the last four or five years, I’ve been able to gradually managed to change my honorific title (where one is required) in many places from the traditional and assumed “Mr.” to the gender-neutral “Mx.” Initially, it was only possible to do this where the option was provided to enter a title of one’s choosing – you know: where there’s tickboxes and an “Other:” option – but increasingly, I’ve seen it presented as one of the default options, alongside Mr., Mrs., Ms., Dr., and the like. As a title, Mx. is gaining traction. 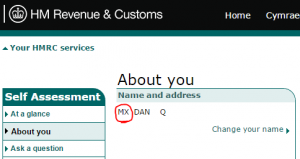 HMRC are among the organisations to whom I’ve been known as “Mx. Dan Q” for several years. I’m not genderqueer, mind. I’m cisgendered and male: a well-understood and popular gender that’s even got a convenient and widely-used word for it: “man”. My use of “Mx.” in a variety of places is based not upon what I consider my gender to be but upon the fact that my gender shouldn’t matter. HMRC, pictured above, is a great example: they only communicate with me by post and by email (so there’s no identification advantage in implying a gender as which I’m likely to be presenting), and what gender I am damn well shouldn’t have any impact on how much tax I pay or how I pay it anyway: it’s redundant information! So why demand I provide a title at all? 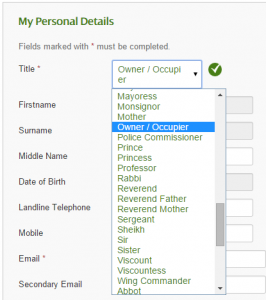 Despite offering no fewer than 85 different titles (and no “Other” option), not sorted alphabetically, Scottish Power don’t permit “Mx.” nor a blank option. 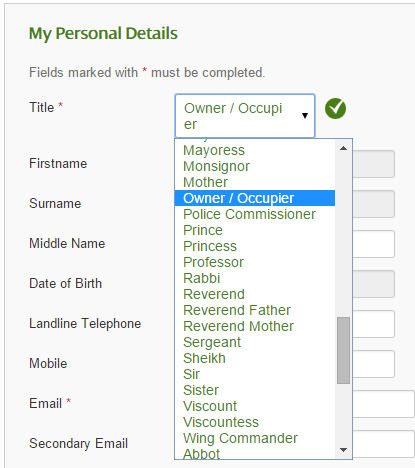 Instead, I’m going by “Owner/Occupier”. I don’t object to being “Mr.”, of course. Just the other day, while placing an order for some Christmas supplies, a butcher in Oxford’s covered market referred to me as “Mr. Q”. Which is absolutely fine, because that’s the title (and gender) by which he’ll identify me when I turn up the week after next to pick up some meat. I’d prefer not to use an honorific title at all: I fail to see what it adds to my name or my identity to put “Mr.” in it! But where it’s (a) for some-reason required (often because programmers have a blind spot for things like names and titles), and (b) my gender shouldn’t matter, don’t be surprised if I put “Mx.” in your form. And if after all of that you don’t offer me that option, know that I’m going to pick something stupid just to mess with your data. That’s Wing Commander Dan Q’s promise. 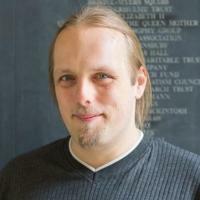 Great article as always, great blogs. Really interested. Gary Truman likes. Great article on marmite as well. I sometimes smother myself in marmite and pretend i’m a slug. Bit weird, but oh well.